When it comes to choosing which golf exercises are worth your time and effort, it can be the easy-looking ones that sometimes pack the most punch. Golfers can get drawn into trying out the ones that look cool, like standing on top of a Swiss Ball and swinging a club. PLEASE DO NOT do this exercise. It’s not cool and the risk-reward ratio is almost as bad as listening to Johnny Miller (yet again) pick apart the best golfers on Tour. BTW, I’ve had several incidences where I almost stabbed myself in the eye with a golf tee while listening to Miller. If it weren’t for the mute button, I’d be blind by now. 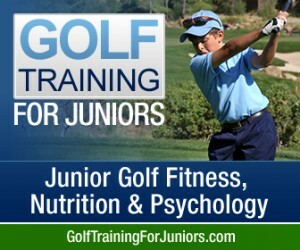 On the other hand, I’ll show you a golf exercise today that, to the untrained eye, looks as silly as John Daly’s Loud Mouth golf attire… but is actually “uber cool” in the benefits that you’ll see on the course and your scorecard. 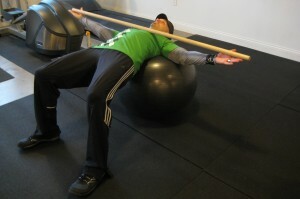 One of my mentors, Paul Chek, refers to The Supine Lateral Ball Roll as a “Big Bang” golf exercise, because not only does it work numerous muscle groups simultaneously, but it also works on balance and proprioception. Proprioception is a fancy word for the ability to know where different parts of your body are in space, without looking at them. You think that might be useful in your golf swing, as in “feeling” your position on your backswing? Ok, enough of the build up, let’s get to it! Following you’ll find a description, photo, and video. 1) From an upright sitting position, walk your feet out and roll back on the Swiss Ball so that your upper back and head are supported by the Ball. 2) Place a dowel rod across your chest and extend your arms out to the side, with an open handed, light grip on the dowel rod. Although not necessary to have the dowel rod, it does a nice job of keeping your arms level with the floor. 3) Place the tip of your tongue on the roof of your mouth, behind your front teeth (the same maneuver we discussed in this post Golf Power On The Tip Of Your Tongue). 4) Keeping your hips up high and level, begin by laterally rolling to one side, to the point where you just start to feel unstable (or just short of losing perfect form). The most common form fault is allowing the opposite side hip to drop i.e. you are moving right, so your left hip will want to drop. 5) Hold the end position for 3 seconds. 7) Perform 4-6 reps on each side. NOTE: In order to get the “Big Bang” benefits from this exercise, is it important to pay strict attention to perfect form. If it seems “easy” on the first attempt, check your form. If it still feels easy, then work to go a little further laterally, and/or shuffle your feet to that side, allowing more range. Now again, if you do this golf exercise in a public gym, you won’t get any “oohs and aahs” from the peanut gallery. 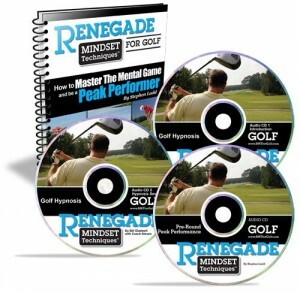 Let those golfers spend their time on Swiss Ball circus tricks that look “cool”, while you get your Renegade Golf Exercises on, by intelligently choosing the exercises that will have a high carry-over to the golf course, and not risk getting you on the injured reserve list. 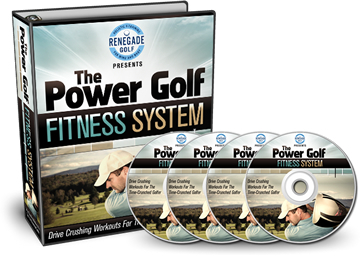 This System will consist of a detailed manual and videos taking you through all four phases of The Renegade Golf Fitness System, just like the tour pros (but modified to fit into the schedules of people with “real lives” and commitments). More details on that coming up. 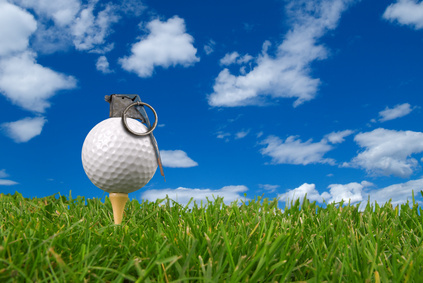 Be a Big Bang Renegade Golfer… and Get After Old Man Par! Previous post: Are You Full Of Crap?